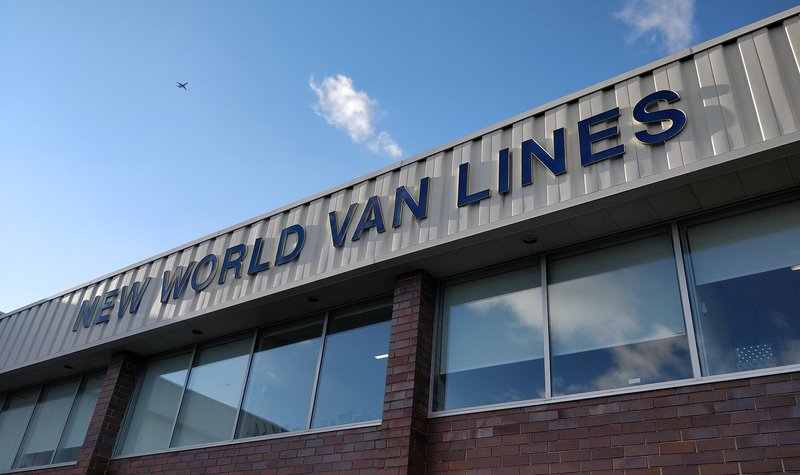 To start off 2019, New World Van Lines is focusing on one of their core values: People. 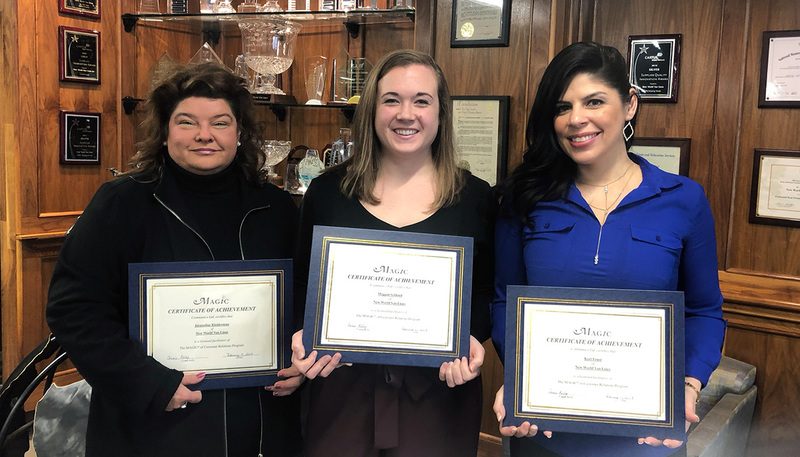 Three New World Employees completed multiple training session and spent many hours of their own time to became certified MAGIC® trainers. Make A Great Impression on the Customer, also known as MAGIC®, is a 16 hour course that focuses on creating a culture based on exceptional service. The program, which was created by Communico Ltd has been around for over 40 years, teaches employees to lead internal and external customer interactions, handle difficult situations, and make a great impression with every interaction. Jackie, Meggan and Kori, our dedicated training team, have led the very first week of on-site training this week. Over the next 10 months every employee including office, driver and mover will receive MAGIC training. New Quarters for New World-EMEA! 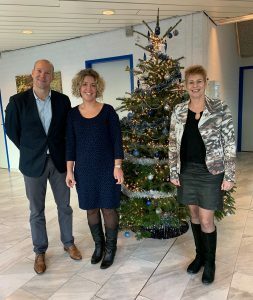 The managing director of NWI, Edwin Ooms, travelled to England, Belgium, Holland and France to meet with customers, network partners, and to see NWI’s new offices in Rotterdam, The Netherlands. Rotterdam is home to the largest port in Europe and known as “the gateway to Europe” due to its deep-rooted trade history and robust logistics distribution system that feeds the rest of Europe. On top of that Rotterdam was named European City of the year in 2015 for its tolerance, diversity and unique modern architecture. Therefore, it is a very fitting location for our International office that serves our customers in the European, Middle-East and Africa (EMEA) time zones. 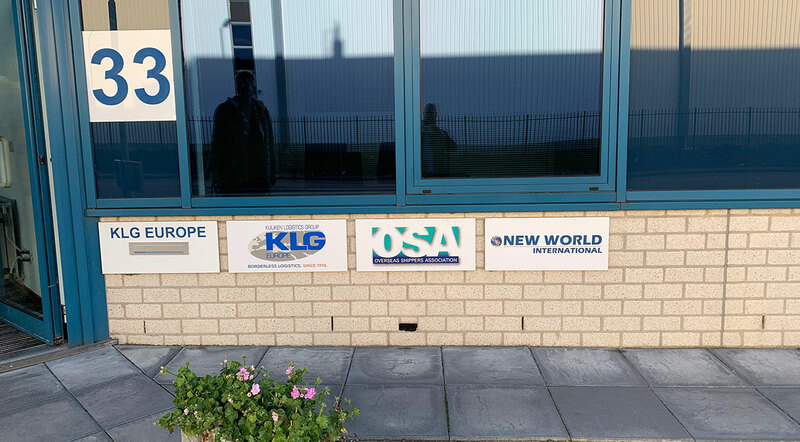 The new offices are in Rotterdam’s distribution area “Albrandswaard” and housed in the facilities of our partner KLG. It was an exciting and productive trip filled with great visits to show our appreciation for the industry, develop new business and meet our NWI-EMEA team. 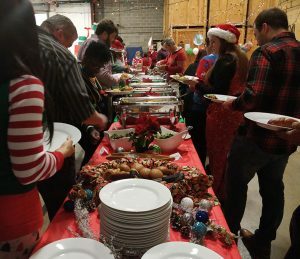 The warehouse was filled with the sounds of laughter and joyous cheer at the New World offices today as the Holiday Luncheon was underway. With delicious foods and deserts, employees wearing their festive outfits and bright smiles gathered to enjoy the festive mid-week break together. The luncheon was also a welcome event to reconnect with some former retirees who came to visit and enjoy the holiday spirit with the company. 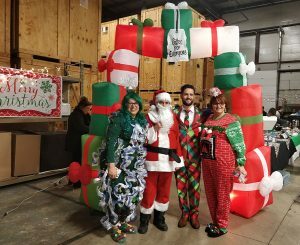 A costume contest was held with three prize winners – Regina from Operations in third, Steve representing Customer Service in second, and Julie, our dazzling holiday tree in first! To conclude the festivities, a raffle for all of those who donated to the toy and winter wear collection was held. All donations will be donated to Connections for the Homeless in Evanston Illinois. The New World Culture Committee, also known as the NWCC, assembled 26 donation bags for the residents of Deborah’s Place. Deborah’s Place is a women’s shelter that is open to homeless women in Chicago since 1985. They support housing and services that help women achieve their goals and move on from experiencing homelessness. The bags contained necessary personal items including, toothbrushes, shampoo, conditioner, lotion, feminine products, deodorant, and Kleenex. Along with the individual bags, NWCC gathered additional requested items from the shelter. This included laundry detergent, all-purpose cleaner, dish soap, denture cream, and toothpaste. These items will be used in the communal areas for residents to use. The NWCC is a group of employees that gather to work to improve employee morale within the company by fostering opportunities for professional and personal growth and developing inter-departmental camaraderie to improve our New World Experience. New World Van Lines and New World International support an active corporate citizenship and charitable works initiative. Called “ACT” (Actively Caring Together), it allows us to take action collectively and individually to make a positive impact on the communities we operate in. New World Van Lines was honored with a SmartWay® Excellence Award from the U.S. Environmental Protection Agency as a true industry leader in freight supply chain environmental performance and energy efficiency. 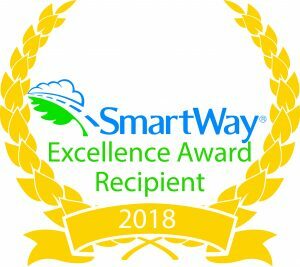 New World Van Lines was one of 40 truck carriers to receive this distinction, representing the best environmental performers of SmartWay’s 3700 Partners. The Excellence Awardees were honored at the 2018 American Trucking Associations Annual Management Conference & Exhibition in Austin, Texas on October 29, 2018. On Wednesday, October 31st, New World employees showed up in their best Halloween costumes to show their Halloween spirit! In the afternoon, the annual Halloween party and Halloween costume contest was held. Employees gathered for drinks and snacks including juice, lemonade, caramel apples, chips, and donuts. 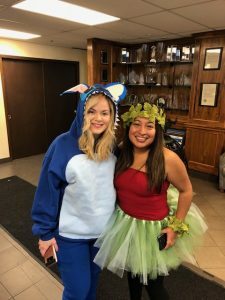 Our third place winner was a team costume where two of our customer service employees, Estolia and Evelyn, dressed up as Lilo and Stitch. 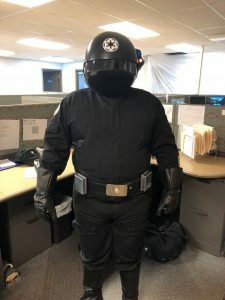 Second place when to one of our newest customer service employees, Chris, and he was dressed up as an Imperial Gunner from Star Wars. 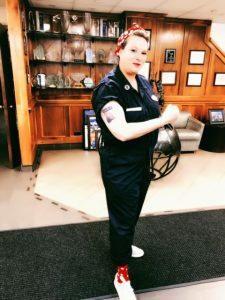 Our 1st place prize went to Erin, a member of our customer service team, who dressed up as Rosie the Riveter. Each winner received a target gift card. We also gave a prize to our billing department. 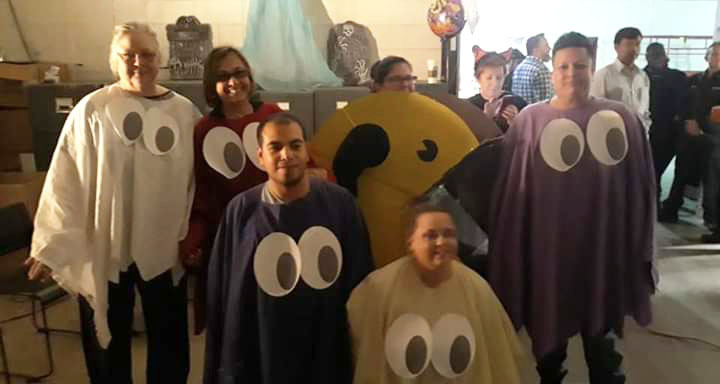 Denise, the director of billing, dressed up as Mrs. Packman and the rest of her team dressed up as her ghosts! They will receive a team lunch! 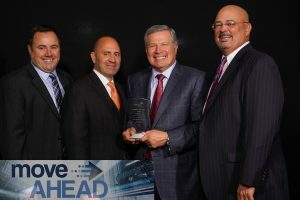 New World Van Lines attended the two day 2018 Cartus Award Ceremony in Danbury Connecticut. We took home the Silver award for customer service, and were honored to win the Platinum Innovation award for our Mover Mentor Mentor Program and our results of improved customer service, lower claims, fewer vehicle accidents, reduced workman’s compensation claims and higher retention of drivers and movers. Cartus Global Network Conference 2018 Award Winner, New World Van Lines. Photo by Alabastro Photography. Over the course of five months, our mentors worked with more than 150 different crews on nearly 300 relocations, offering personalized guidance and training to each driver and mover with whom they interacted. Beyond the obvious emphasis on offering insights to packing and loading quality, the mentors promoted their personal approaches to helping transferees feel more at ease with the moving process, mitigating difficult situations, educating employees on the electronic logging device (ELD) mandate, and offering training on the usage of web-based tools, such as New World’s proprietary DRIVE portal. For every job attended by a mentor, the Master Movers submitted a crew feedback form, collecting more than 50 individual points of data, encompassing crew preparation before the job begins, the success of interactions with the customer, to the proper completion of the job, after the truck “pulls away”. 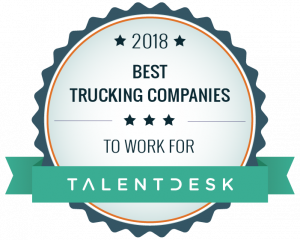 This data provided New World with valuable direction for how the company can continue to offer targeted training beyond the program’s completion.